Styling: It’s funny, I don’t think I’ve ever showcased this outfit on the blog or on Instagram, but I do wear it often – so often that I don’t even have to think about the pairing. The boxy fit of this blouse plus the longer, tailored sleeves dress up the chinos nicely. I’ve also done this look with dressy sandals and champagne flats, but it’s summer casual at my office, so I just went all out with the floral sneaks. 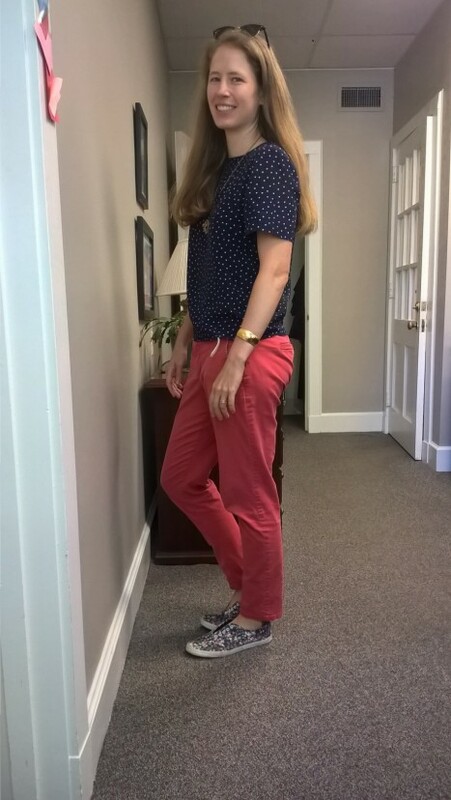 Thoughts: This outfit isn’t groundbreaking, but it is “me.” The color palette and tailored top + casual pants just feel like no-brainers and I feel relaxed and chic at the same time. Do you all have an outfit you wear so often it doesn’t feel remarkable to you at all – yet it has enough oomph to keep you coming back? Scroll down to comment! Those coral pants and the navy-dot top scream summer to me! The outfit is very flattering on you. I don’t have a particular outfit but in summer I reach often for my ankle pants, a V-neck Tee, earrings and a bracelet. Always with sandals, but the occasion dictates if they are slight heels, or with a little more height. Ahhh, I love summer, but here in NH it seems so short!! Enjoy summer while it lasts! I know it’s been a looooong time getting started this year in New England.